Red Couch Recipes: Tablescape Thursday: Tablescape Inspired by My Husband's Plaid Shirt! 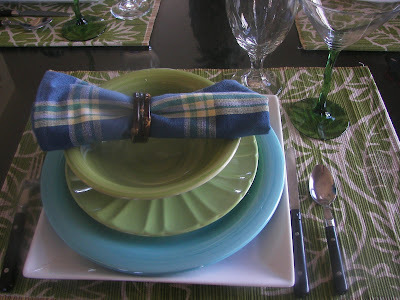 Tablescape Thursday: Tablescape Inspired by My Husband's Plaid Shirt! This is the shirt of my husband that inspired my tablescape for this week. It is not that special of a shirt, it is just a casual shirt. In fact, it looks like it needs to be ironed!! 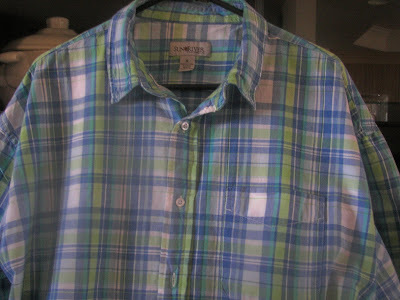 I love the colors of turquoise and lime green together...especially in a plaid. 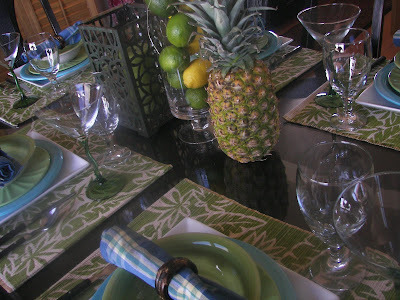 It may be a bit weird to fashion a tablescape after a favorite shirt, but that's me! 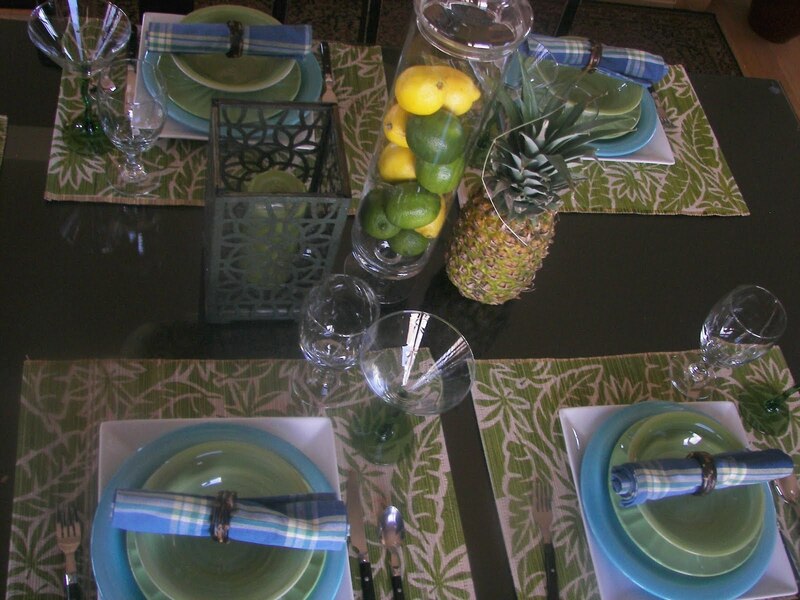 Okay, so I think the plaid napkins do go well with the leafy placemats. What do you think? The square plates are the ones that my sister couldn't take on the airplane years ago...I have used them so much! Thanks, Jeannie! I tried to go with a semi-tropical theme here. Is it working for you? This is a long shot view! I think it's easier to put citrus fruit in an apothecary jar, rather than candy...easier on the wallet and waist. This apothecary jar requires a lot of candy to fill it! Do you like the reflection of our lamp in the glass? It's like one of those lamps in the artwork that depicts the dogs playing poker. Okay, so it was already installed when we bought the house almost three years ago and we haven't changed it out. An overhead shot of my 'scape! A side angle shot of my 'scape. I am joining Susan at Between Naps on the Porch for Tablecape Thursday. Click on the image below to see amazing tablescapes. Very pretty, Joni- I really like the mats! This is fun - love it! Joni, This is gorgeous! I love the colors! Mix and match is so much fun and you did it up right! It's amazing where we find our inspiration, isn't it? Darling table!! What a great idea...I'm going shopping in my guys closets!! Thanks for the inspiration! I love lime and turquoise together too. Very pretty table! I think it's just perfect. Very, very clever and inviting. Speaking of shirts and inspiration, I was thinking of making napkins for father's day out of old tropical print shirts. Joni, my favorite color combo...greens/blues...I love your table! Hi! 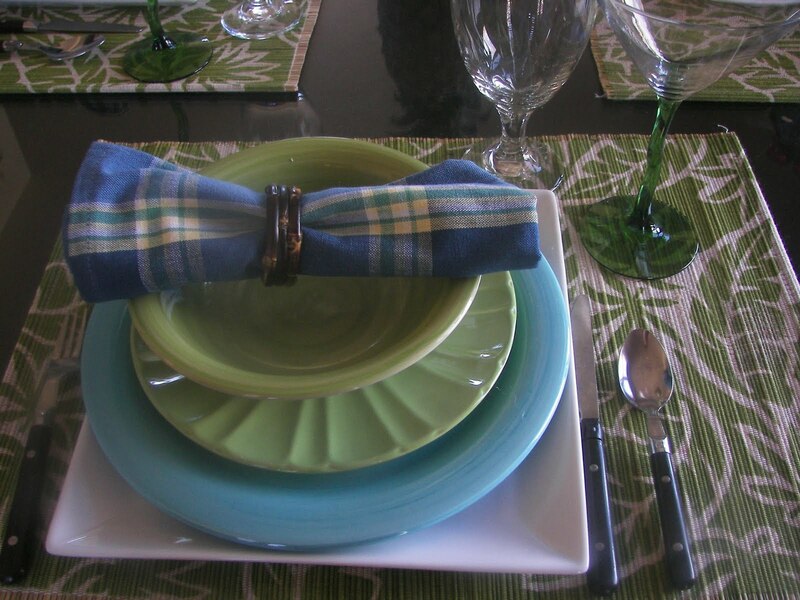 I think this is a great tablescape... What fun that you decorated with a plaid theme for your husband's shirt! Super! Love the blend of colors too. Definitely a tropical theme! I love those colors together, too, and your layering of the plates really ties everything together nicely. The martini glasses add a fun touch, and so do the pineapple and citrus in the centerpiece! Your husband's shirt has inspired a lovely tablescape, it's very spring like and colourful. Thanks for stopping by in Normandy today, we love new friends coming to call. Yes, the tropical theme is working for me, and I love your inspiration. The blues and greens look so cool and inviting. 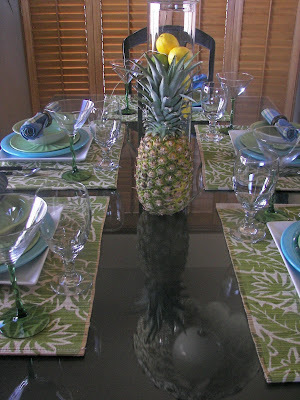 This is a charming and unusual tablescape, and I love the tropical flair. Very Nice! I like that plaid too! Nice color combo! good idea for a table too! I love all the blue and greens. I still have a long way to go with my cooking. I love how the fruit ties the whole thing together! This is a very pretty table. This is such a pretty color combination -- we never know where we'll get our inspiration...do we! turquoise and lime green! these are my 2 favorite colors to mix snd mstch in my clothes. 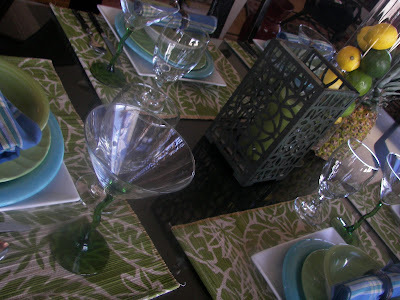 Your table looks great and you have inspired me to put them together on my tsblr as well. I 100% agree with you on filling the apothecary jars with fruit instead of candy! Much easier on the eye, the wallet, and the waistline. Great looking table. 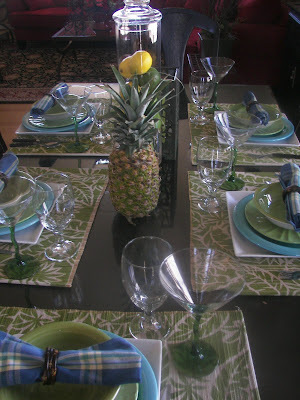 I like the plaid napkins and the pineapple theme. What a fun table. I'm intrigued at how the napkins came to match the inspiration piece. - Jane F.
What a clever, clever idea! 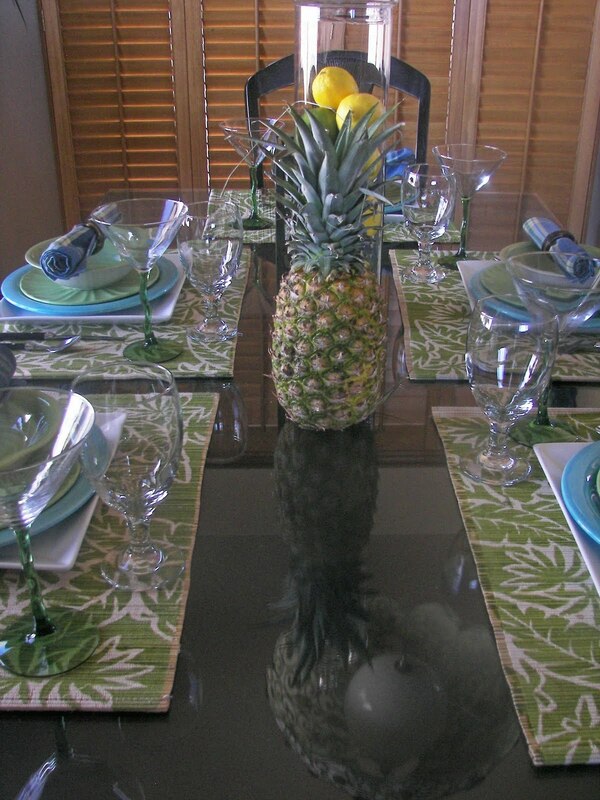 And love the pineapple vase with the tulips! Your table looks absolutely beautiful! Thanks for visiting at Life is Good!